The hostel in Kendoon (outside of Dalry) is one of those that doesn't serve food. Since we carry nothing more than snacks (mostly Cadbury chocolate for me), we had to ride before breakfast. We made twenty-odd miles before stopping for a great breakfast. 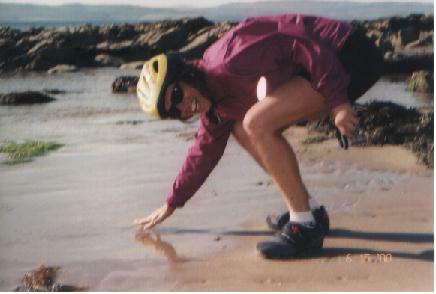 Then we were off for Ayr, on the coast. We headed up the coast towards Androssan where the ferry for Arran leaves from. The shore is pretty heavily developed, but drivers here are great and it's easy to ride even in city traffic. The weather was incredible. Not the stereotypical Scottish drab and gray. It was warm and sunny, with high puffy white clouds. 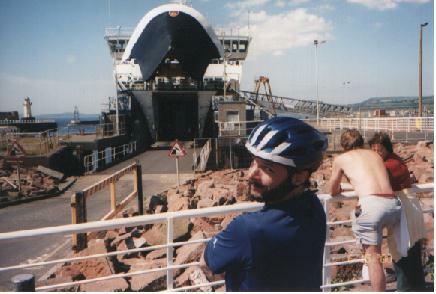 The ferry docks about halfway up the east side of Arran, and we headed up and over through the middle of the island. We turned north and had an incredible ride right along the shoreline, with a nice tailwind and almost nonexistent traffic. Lochranza is a small town, with an old castle standing right on the beach. We just got back from an incredible dinner. We didn't have food, we had cuisine. It's 11:30 now, so must get off to bed. The ferry tomorrow morning leaves about 200 yards down the road from the hostel. Convenient!